Clifton Sanitation District responds to wastewater emergencies 24 hours a day. If you have a wastewater or sewer emergency, please first reference our Wastewater Department Frequently Asked Questions to see if a possible solution to your problem is there. If you can't find an answer to your particular issue on that page, call Clifton Sanitation District at 434-7422. What I am Responsible For? The side sewer, also known as a lateral sewer, carries waste from your home toilets and drains to the District’s main sewer line, where it continues to the wastewater treatment plant. Most homeowners experience sewer problems in the side sewer line, which they are responsible for maintaining and repairing. 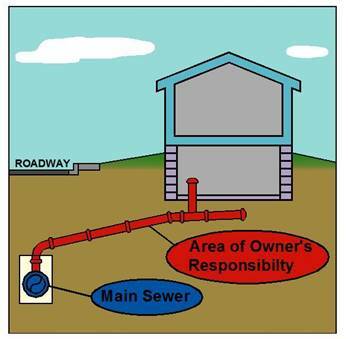 See the side sewer diagram to better understand how your side sewer connects to the District’s main sewer line. All homeowners should be aware that not all homeowners’ insurance policies will cover costs incurred with sewer backing up in their home. A standard homeowner’s policy does not include coverage for water and sewer backup. If your service line should become plugged and sewer backs up in you home, it could do several thousand dollars worth of damage. Please check your policy or check with your agent to be sure you are covered if a mishap should occur. Most insurance companies do offer just a water and sewer backup coverage by itself. 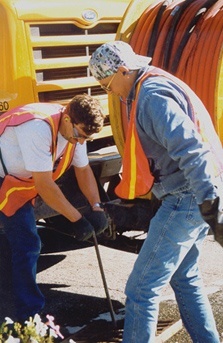 To help alleviate the chance of a backup occurring, the district has an annual sewer cleaning program in place where we clean a third of the district lines every year. We are only responsible for our main line, not your service line. Sewer backups are usually unexpected and always create a mess. At best, the backup requires unpleasant cleanup and sometimes expensive damage. Who is going to fix the problem? That depends on whether the stoppage is in your private line or the Clifton Sanitation District main. If it is in the District’s main, we fix it as quickly as possible and keep you informed about what’s being done. If the problem is with the private line connecting your house to the District main, we’ll tell you so you can get it fixed. It is against the law for the District to work on private property. How do I tell if my sanitary sewer problem is in my house plumbing or in the public sanitary sewer main? Generally, if the problem is within the house plumbing or private sanitary service lateral, turning off all water use will stop the backup. You pay the bill. This is why it is important to make sure your homeowner’s insurance covers sewer backups. Will the District reimburse me for the damage if the backup is in the District’s main? Only if we had advance knowledge that the District system was at fault and we didn’t fix the problem. Is this District policy or law? This is law. Public funds can’t be spent for private purposes. The District is only responsible for its own property – not your line or connection to the main. The District can only be held liable for damages if we knew we had a problem and didn’t fix it in a reasonable time. How do I find out if I can be reimbursed? If the stoppage is not in your private line, you can file a claim. District staff will investigate to see if the District is liable, which includes prior notice of the District system’s problem. Make sure you have proper insurance. Sewer backups are not automatically covered by all homeowner’s insurance policies. Check your policy to make sure you are covered for damages due to sewer backups. Remember, the District is not an insurer. The District can only pay for damages under extremely limited circumstances set out by law. Don’t assume you’re covered! You may need a special option for coverage. Talk to your insurance agent. What is the cost to perform a given service? What is the company's guarantee for their work? How long does the guarantee last? Most homeowners have experienced a temporary blockage or sluggish drains in their plumbing. Minor blockages often can be cleared with a plunger. Cooking grease, hair, food particles, toilet paper and roots often cause sluggish drains or line blockages. If they happen near the drain opening or toilet bowl, a plunger may be effective in clearing them. However, if the problem is some distance into a drain line, it may require a plumber to locate and resolve. If you have a blocked or stubborn drain, the first thing you want to do is reduce or eliminate the water you put in the lines to minimize the amount of damage you may do. Obviously, if you keep flushing a slow-moving toilet, it will overflow the bowl, damaging your floor. Washing machines can create one of the biggest problems when your drains are running slowly. Washers use 15 to 20 gallons a load. This water could back up into toilets or showers, possibly causing overflow damage. It is relatively easy to find out if the blockage is in the house drains or in the sewer lines. Many homes have a cleanout and it is usually located near the foundation of the house. First, check the cleanout to see if it has water in it. If it contains no water, then you know the blockage is somewhere in the house plumbing. If there is water standing in the cleanout, the blockage is most likely in the line from the house to the main sewer line. Under these circumstances you should discontinue using your facilities and contact the District office, at 434-7422. Dispose of grease and fats with your trash, not down the drain. Even if you run it through a garbage disposal, grease in drains can collect and harden into a plug. Never connect sump pumps, French drains or other flood control systems to your sanitary sewer. It's illegal and the debris and silt will clog your line. Call a plumber to undo illegal connections. Tree roots, a common cause of sewer problems, will grow deeper and farther into the ground to find a water and nutrient source. Sewer pipes installed prior to the 1980s were typical of the clay pipe style, which can allow roots to access and disrupt the wastewater flow in your sewer. A root cutter can be utilized to correct this problem. Once again, we recommend contracting with a sewer cleaner or plumber to correct this problem, as most homeowners will generally not be familiar with or have the equipment needed to perform the work. For the do-it-yourselfer who would prefer trying to correct the problem on his/her own, this type of equipment may be rented from a local vendor. Call the District at the first sign of a problem – before the sewer backs up – at 434-7422. If your drains are running slowly, for example, call us. We'll come and check the District’s sewer main. Does Clifton Sanitation District have a recreational vehicle (RV) waste disposal site? This service is not available at this time. However, there are facilities within our service area that provide that service. An RV waste disposal site is located at the Clifton KOA near the intersection of Patterson and I-70 B. Is domestic septage from licensed commercial haulers accepted at the plant? No. 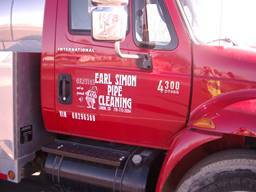 Clifton Sanitation District is not a receiving facility for domestic sewage from licensed haulers. For what other types of situations would I contact the Clifton Sanitation District? Q: Why do maintenance crews cross my property? A: It is unfortunate that in some cases utilities are located behind the property. The Wastewater Collection Division has to access the sanitary sewer manholes to perform routine and emergency operations. Easement agreements are written so that the owner of the utility is allowed to cross the property to perform the work. The District makes every effort to contact the property owners when it is necessary to enter private property to perform the work.